Neemuch or Nimach is a town in the Malwa region in state of Madhya Pradesh, India. Neemuch shares its north eastern border with state of Rajasthan. It is the administrative headquarters of Neemuch District. Neemuch shares its north eastern border with state of Rajasthan. It is the administrative headquarters of Neemuch District. Nimach is an abbreviation of "North India Mounted Artillery & Cavalry Headquarters". Formerly a large British cantonment of Gwalior princely state, the town in 1822 became the headquarters of the combined Rajputana–Malwa political agency and of the Malwa Agency in 1895. It is a road junction and distribution centre for agricultural products. It is the birth place of Central Reserve Police Force (CRPF) in 1939. The town hosts a large scale recruit training center for CRPF, and still maintains Neemuch's British Military Cantonment, one of the first of its kind in India. Neemuch is known as India's Eye donation capital as it accounts for the highest per capita eye donation rate in the country. Neemuch has been known for the production of opium, through the government-owned Opium and Alkaloid Works. Handloom weaving is the major industry here. Cement industries and Soy oil plants are there in vicinity.In 1857, Neemuch was the most southerly place to which the Mutiny extended. A brigade of native Bengal troops were stationed at Neemuch, then mutinied and marched to Delhi. European officers took refuge in the fort, and were later besieged by a rebel force from Mandasor. The Europeans defended the city until relieved by the Malwa field force. 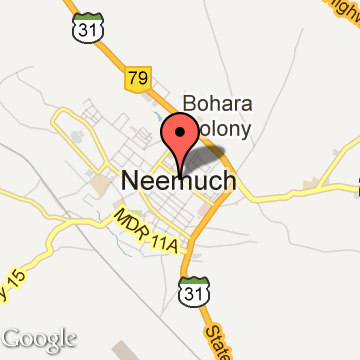 Since 1895 Neemuch has been the headquarters of the political agent in Malwa. This district was created on 30 June 1998 by separating Neemuch, Manasa and Jawad tehsils of the erstwhile Mandsaur district. During the British rule, the district headquarters Neemuch was a cantonment town, known as the North India Mounted Artillery and Cavalry Headquarters (NIMACH). It was later converted into the headquarters of the Crown's Representative Police Force in 1939. Neemuch Tourism - Get all information on Neemuch tourist places and sightseeing tours. Our website helps you plan your next tour and gives you great ideas on what to do, where to eat, where to stay and when to go there. We give the best information from the web to give you precise, meaningful and useful travel guide for leading places to visit in India and from across the world. Our travel information on NEEMUCH tourist places, tourist attractions, major sightseeing, the best time to visit, the top places to visit in Neemuch, the must-see things to see and do, maps, restaurants, hotels, nearby tourist destinations, local public information and more. To start with check out information on how to reach Neemuch.